It was all about "Moonlight" and "La La Land" at the 89th annual Academy Awards, a ceremony that ended with major confusion. The moment at the conclusion of the Sunday-night show was so jaw-dropping, it eclipsed everything else in a ceremony that was packed to the brim with Donald Trump jabs, fun stunts, heartfelt positivity and a stunning upset by “Moonlight” over what had been a “La La” juggernaut throughout the awards season. Yet somehow, even the embarrassing moment pivoted into grace. 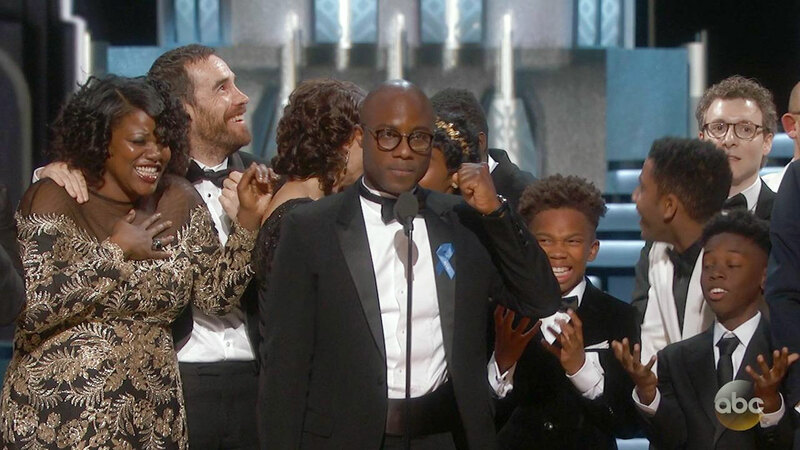 As confusion and bafflement overwhelmed those in the Dolby Theatre and at home on their couches, “Moonlight” director Barry Jenkins and “La La Land” director Damien Chazelle shared a hug on the back of the stage, out of sight from the television cameras. There’s no denying, though, that “Moonlight’s” win over “La La Land” was a massive upset, made only more pointed by the envelope gaffe. Chazelle’s candy-colored musical was widely presumed to be a shoo-in for the top prize after its record-tying 14 nominations and a relative sweep of the awards season. The film still won six Oscars, including best director for Chazelle, who at 32 became the youngest ever to take the prize, and for score, song (“City of Stars”) and actress to Emma Stone. The best picture mix-up apparently wasn’t the only gaffe at the Oscars. An Australian film producer’s photo was mistakenly included in the “In Memoriam” tribute. Jan Chapman’s photo was shown with the name of Janet Patterson, an Australian costume designer who died in 2015. The Academy didn’t respond to a request for comment. The academy usually throws awards at films that gaze lovingly at Hollywood, but Barry Jenkins’ heartfelt coming-of-age drama seduced academy voters in the end – a subtle tide change perhaps informed by both a prickly political climate and an urgent imperative to honor more diverse films after two consecutive years of OscarsSoWhite. Diversity could be found in every corner of the awards this year, with supporting acting wins for “Moonlight’s” Mahershala Ali and “Fences'” Viola Davis, although the best actor category proved to be a bit of an upset when Casey Affleck won for “Manchester by the Sea” over Denzel Washington of “Fences,” who had picked up momentum in recent weeks. The improvement followed efforts by Academy of Motion Pictures Arts and Sciences President Cheryl Boone Isaacs to diversify the membership of the largely white, older and male film academy. “Tonight is proof that art has no borders, no single language and does not belong to a single faith,” said Isaacs. Ezra Edelman, whose nearly eight-hour epic “O.J. : Made in America” took best documentary, dedicated the award to the victims of the famous crime, Nicole Brown Simpson and Ronald Goldman. The majority of speeches were moving and personal and generally in praise of art’s ability to create empathy in the world, including Jenkins’ in his win for adapted screenplay, who said, “All you people out there who feel like there isn’t a mirror out there for you, the Academy has your back, the ACLU has your back, and for the next four years we will not leave you alone, we will not forget you.” But not one speech came close to Meryl Streep’s Golden Globes barnburner. “Personally, I didn’t say anything because my head was completely blank,” Affleck said backstage of his not political speech. Instead, politics stayed largely with host Jimmy Kimmel, who kept his barbs coy and irreverent, stating at the start that he wasn’t the man to unite the country. “Remember last year when it seemed like the Oscars were racist?” he said in the opening. The evening’s most blunt protests against Trump came not from the A-list stars but from foreigners, a few of whom were not even in attendance and could communicate their sentiments only through statements. Iranian director Asghar Farhadi, whose “The Salesman” won best foreign film, his second win in the category, did not attend the ceremony in protest of Trump’s travel ban to seven predominantly Muslim nations. Oscar flap eclipses ‘Moonlight’ Win, but civility reigns during the Oscars 2017. A review of #Oscars2017 night, winners, and controversies.